GET AIRBORNE: Let us show you why thousands of people have enjoyed this once in a lifetime experience. Contrary to popular belief, you are not ‘leaping of a cliff’ you are simply running a few steps and then you are airborne. 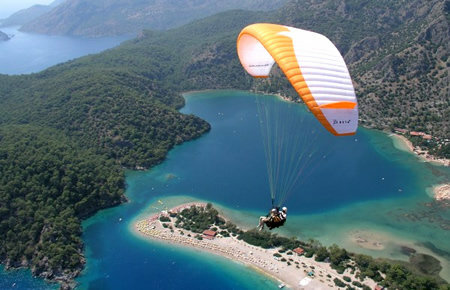 Ölüdeniz has one of the highest commercial take off points in the world. 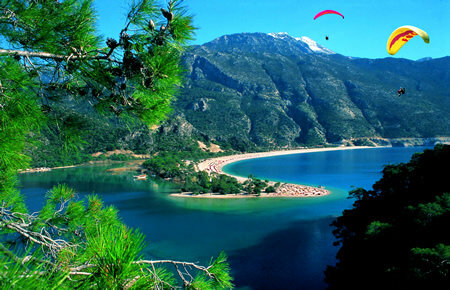 The take off point is at 6550 St looking over Ölüdeniz on the Babadağ Mountain. You will have the most spectacular view of the area around, and you also have the choice of experiencing 360 degree turns and wing-overs. You will be flying for a minimum of 30 minutes up to 45 depending on the thermals. If you are flying in a group you may even be able to fly side-by-side giving a great photo opportunity to show all your friends back at home. Landing is just as easy as take-off, your pilot will step-down first followed by you. After landing you may not be able to wipe the smile off your face!!! Non-flying members of your group are able to wait down at the landing area, where radio contact is available to all pilots, enabling them to know which paraglider is yours so they can watch your flight and landing. 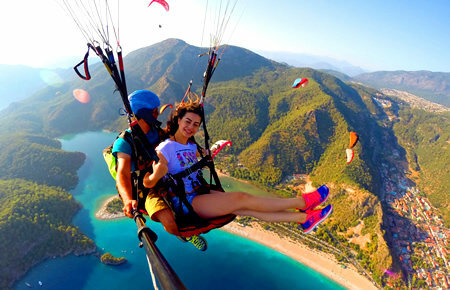 SAFETY: All adventure activities have an element of fear, and that’s what makes them so exciting. All of our pilots are fully trained and licensed professionals with many years of experience and an excellent safety record. They will take every precaution to make your flight as safe as possible and will provide clear and simple instructions resulting in an amazing experience. While you are up in the sky we are always taking care of you. Fly with professionals, fly with us. A pair of sturdy shoes for example trainers. (If you do not have any, no worries we can arrange some for you).No experience is necessary.2 hours of fun.